Learn more about CS 4410 and the practicum CS 4411 in the course overview. Future course announcements will be posted on our Piazza page (see sidebar link). 4410 meets every Tuesday and Thursday at 1:25-2:40pm in Klarman Hall KG70. 4411 meets slightly more often than every other week at 2:30-3:20pm on Fridays in Phillips Hall 101. 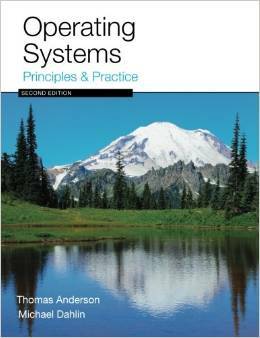 Operating Systems: Principles and Practice, Second Edition. Supplementary: Those of you looking for a primer/refresher on computer architecture material should read Chapters 3.1-3.11, 4.1-4.5, 5.1-5.3, 7.1-7.4, 8.1-8.5 in "Computer Organization & Design: The Hardware/Software Interface" by Patterson and Hennessy. The chapter numbers are from the 2nd edition -- the library has it, or you can find the content listing online and map it to whatever edition you actually have. Keep in mind that this material is purely supplementary: the tests will focus on the OS side of the content in the course and not on architecture. But there are some overlaps with the OS side of the content and the material covered in these chapters, so it may be helpful to those who may have forgotten it over break.